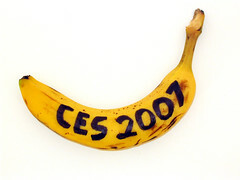 This week I’m in Las Vegas for the uber-mega-geek gadget show, the Consumer Electronics Show. The biggest geek trade show in the country and where most of the geekosphere will be. Unless your at Macworld, which happens at the same time in San Francisco. A few jet setters will do both. I’m kicking it at the BlogHaus, a suite in the Bellagio that my employer has organized for bloggers, vloggers and random riffraff who are looking for some free phat wifi. And booze. Did I mention the free booze? Irina and I will be doing something at the DivX Stage6 booth tomorrow/Monday 1/8 at 3pm. Drop by if you’re in the neighborhood.